Hope Inhumanity is back at Breakout Con 2019 in Toronto! That’s right. From March 16-18 Derek Gour will be a guest at Breakout again this year, and will be running three sessions of Hope Inhumanity. Hope Inhumanity sessions will take place on Saturday March 16 at 2pm and 6pm, and on Sunday at 11am. You can reserve your spot at the game table in the official schedule. Breakout is a great gaming convention. It is well organized, inclusive, and safe. Head down to the convention and play some games! Hope Inhumanity is back at Breakout Con 2018 in Toronto! That’s right. From March 16-18 Derek Gour will be a guest at Breakout again this year, and will be running two sessions of Hope Inhumanity. The core game, and the Martial Law expansion will also be available for sale at the convention, and even better, everyone who purchases a copy of the game or the expansion will get a free Hope Inhumanity dice set which has exactly the right mix of dice to play the game. Hope Inhumanity sessions will take place on Saturday March 17 at 3pm and 9pm. You can reserve your spot at the game table in the official schedule. Breakout is hands-down my favourite gaming convention and I’m so excited to be attending again this year. The convention is so well organized, inclusive, safe, and they are so supportive of local and indie game designers! Head down to the convention and play some amazing games! CanGames is around the corner again, and once again, Hope Inhumanity 2nd Edition will be there, this time with Personality (and Martial Law expansions). For those who don’t know, CanGames is a long running (41 years!!) game convention in Ottawa, Canada. This year’s incarnation happens May 19-21, 2017. In addition to a ton of other activities, I will be running two official sessions of Hope Inhumanity on Saturday evening (May 20), once at 7 pm, and again at 9 pm. Get yourself signed up for these sessions before they fill up, and you go home sad. I don’t want you to be sad. The entire Hope Inhumanity family will be available for purchase at CanGames – at the Ottawa Story Games merch table. That means you can get the core game, the Martial Law expansion, and the super cool dice set that includes all the dice you need to play the game. I hope to see you there! The full CanGames schedule is available here! I’m also running a board game, Sentinels of the Multiverse, and the World Wide Wrestling RPG, as well as playing in a few games. There’s also a chance I’ll run more unofficial Hope Inhumanity demo games at the Ottawa Story Games table. And I’ve heard rumours of a session of The Sword, the Crown and the Unspeakable Power (SCUP) that I will try to get in on. It has taken me many months, but the actual play video for Hope Inhumanity has finally creeped up my priority list high enough for me to actually complete it. This game was filmed in September 2016 with some great gaming friends. They are Alex (firecracker podcaster and RPG personality), Patrick (the amazing editor for the game), Shawn and AJ. They had a great game of Hope Inhumanity, and they were playing with the first Personality play test cards which ended up getting added to the 2nd Edition. This was originally going to be included in a Kickstarter video, but I decided to pass on the Kickstarter. I’m hoping to get a shorter promotional video out soon too. Do I need 2nd Edition to play Martial Law? Do I need 2nd edition to play with the Martial Law expansion? What’s new in 2nd Edition? The answers will shock you! Let’s start with what’s new in 2nd Edition. The game mechanics are exactly the same. The big change is the addition of Personality cards. These add a lot to your character and encourage you to play your character a certain way, similar to how Relationships operate. For example, your character may be the kind of person who will not share food with anyone, ever. Or they may be a vegetarian who is even less likely than most people to eat that rotting carcass you found by the side of the road. Many cards have been improved in 2nd edition. Some scenes are clearer, and many have been scrubbed for gender biases. Some problematic scene cards have been removed altogether, and some Traits and Scenes have migrated to the Martial Law expansion, in part to make room for the Personality cards. The rules in 2nd edition have also been tweaked slightly. Humanity and Hope dice are all limited to five dice. The Hope and Humanity cards now print this limitation directly on the card itself. And now to answer that first question: No, you don’t strictly need 2nd edition to play with the Martial Law expansion. But you will have a better experience if you do. Without 2nd edition, you will be limited to the Personality cards in the expansion, you may encounter some duplicate cards (because they’ve migrated decks in 2nd edition), and you won’t benefit from all the fixes to the 2nd edition cards. I hope that helps. Happy gaming, and don’t let the apocalypse get you down! Hope Inhumanity will be available to play and to purchase at Toronto Breakout Con, March 10-12. I will be there as a guest at Breakout, and while both the game and it’s expansion, Martial Law, will be available for sale at the Indie game store, I will be running several sessions of Hope Inhumanity. The Martial Law games will be sessions integrating the Martial Law expansion into the core game, while the other two will simply use the core game, and not include the expansion. There is still some room in those sessions, so if you want to play the game, sign yourself up so you don’t miss out. I am not running any sessions on Sunday, as I will be a guest judge in the Iron GM contest, which is guaranteed to be a great time. The convention runs all weekend at the Holiday Inn at Yorkdale (3450 Dufferin St). Hope Inhumanity requires at least 30 dice to play a 5 player game. That’s a lot of dice for the average gamer to own. 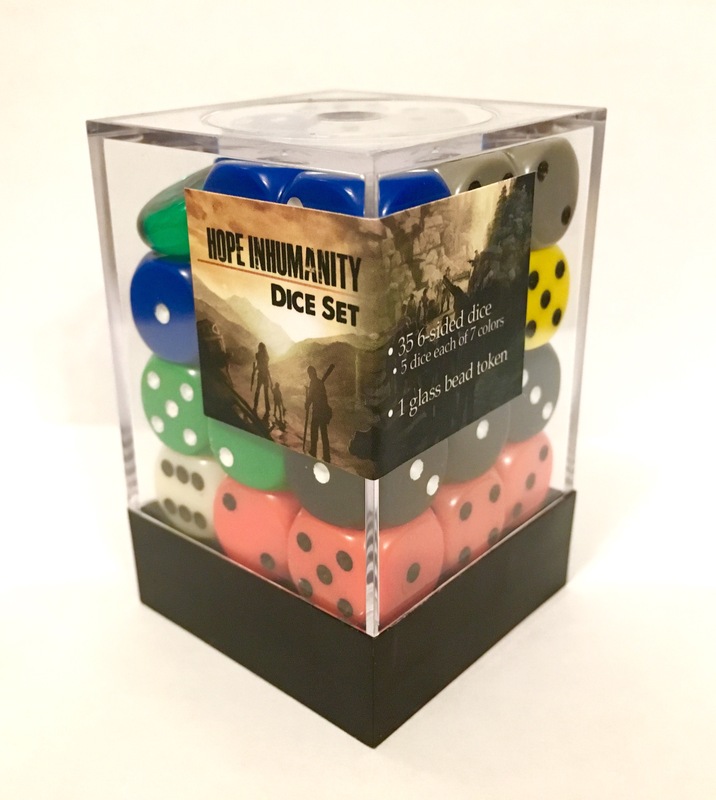 So now there is a dedicated dice set for playing Hope Inhumanity. I will be working on how to distribute and sell these dice sets soon. But they will definitely be available at the Launch Party (February 17) in Toronto, at Breakout Con (March 10-12) in Toronto, and at CanGames (May 19-21) in Ottawa. If you happen to be in Toronto this Friday (Feb 17), be sure to come celebrate the launch of the new and improved Hope Inhumanity and it’s long-awaited expansion deck: Martial Law. The party will kick off at 8PM, will feature free beer & pizza, and several games of Hope Inhumanity running simultaneously. Never before has so much post-apocalyptic angst and anti-heroism been experienced in one place. The launch party will also be an opportunity to try out the new Hope Inhumanity dice sets, tailor made for playing the game, complete with a glass bead to mark rounds. As a thanks to those purchasing the game and/or the expansion at the party, we’ll be giving away a free set of dice along with each game purchase.